Heritage is a manufacturer that makes bicycles which are fashionable, functional, and comfortable — and now every bike they make is automatically registered with the Bike Index as soon as it's sold. Heritage is the perfect manufacturer to have as the Bike Index's first partner. 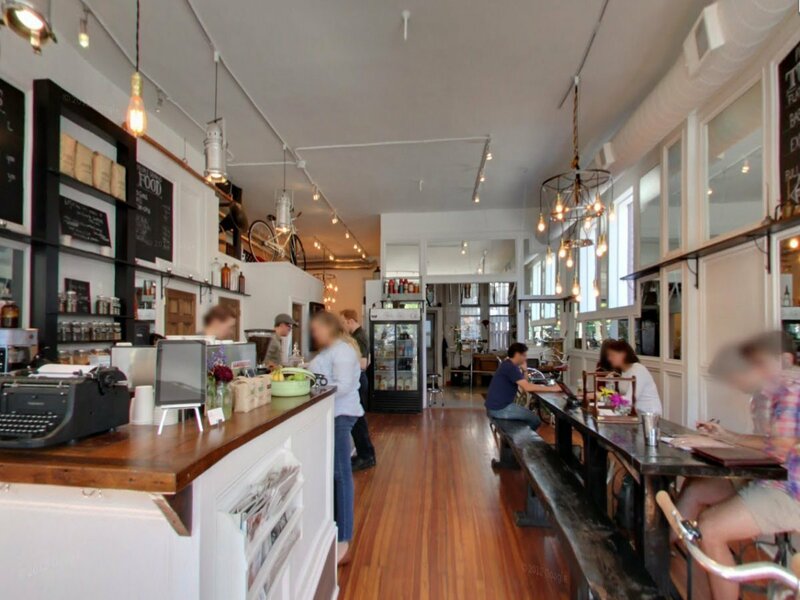 They make their bikes here in Chicago and their store is also a cozy coffee shop. The API version described in this post is deprecated, and our current API is better in every way. Check out our current API documenation at bikeindex.org/documentation. What Type of Chain Guard? The Bike Index has an open API that makes it possible to take the information submitted into the Google form and automatically register the bike on the Bike Index. Google Apps script provides a URL fetch service called UrlFetchApp. Since we have a RESTfull API, we can post the bike to our API endpoint and pass the parameters in. Gotcha #1: Google Apps UrlFetchApp doesn't allow nested objects, so you have to serialize the objects and then parse them on your own server. 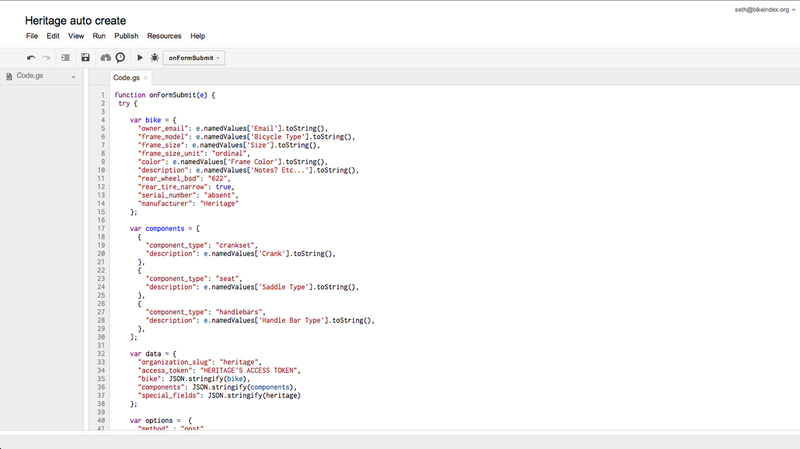 Here is the google apps script that posts the values that are submitted via the form to the Bike Index. If it errors, it sends us an email. This is added to the Google Docs Spreadsheet that receives the form results by going to Script Manager (in the Tools menu of the spreadsheet) and creating a new script. Gotcha #2: The script will not work if you create a script from the Google Form. You have to go to the Script manager from the Google Spreadsheet that receives the form's responses. 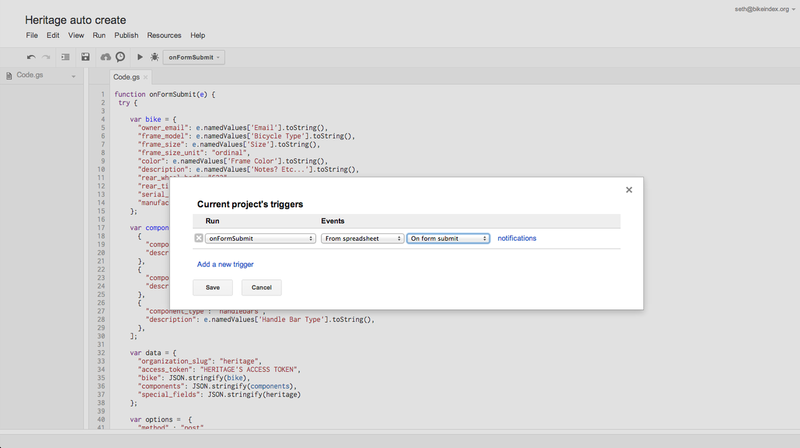 To get this to trigger on form submit, go to Current Project's Triggers under the Resources menu in Google's Script editor and set events to From Spreadsheet, On Form Submit. This trigger needs to be removed and re-added every time the script is edited. And voila! Google Apps now posts to our API every time a bike is submitted through the form and the bike is registered automatically with no extra steps. 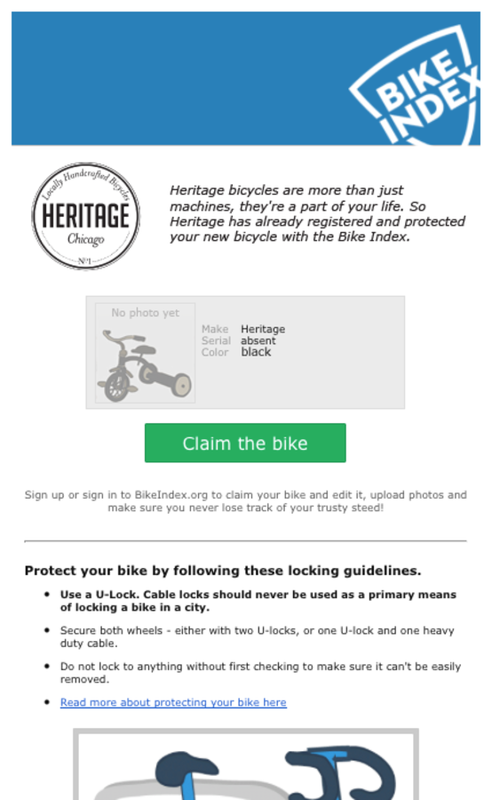 The new bike owner is sent an email, on the top of which we add Heritage's logo and an intro, and they can log in and edit their bike. Registering every new Heritage is incredibly exciting, both because we really like their company and because it prepares us for future integrations. Want to read more? Check out our API Documentation.